I just had to create another Halloween card inspired by the Hand Stamped Sentiment color challenge of Fresh Fig, Pumpkin Pie and Lemon Twist. 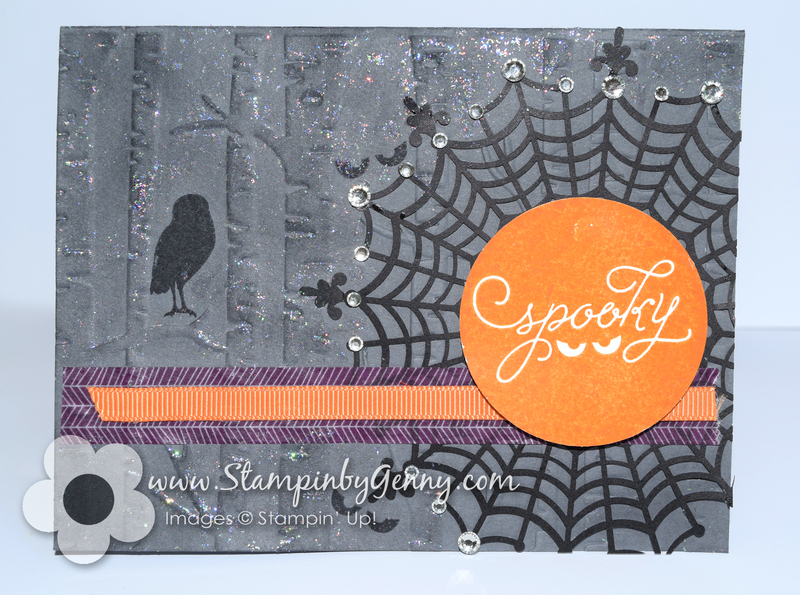 I used the chandelier and other elements from the Season to Sparkle stamp set to create my card. I sponged Fresh Fig, Pumpkin Pie and Lemon Twist on glossy white card stock. The chandelier is die cut from basic black. 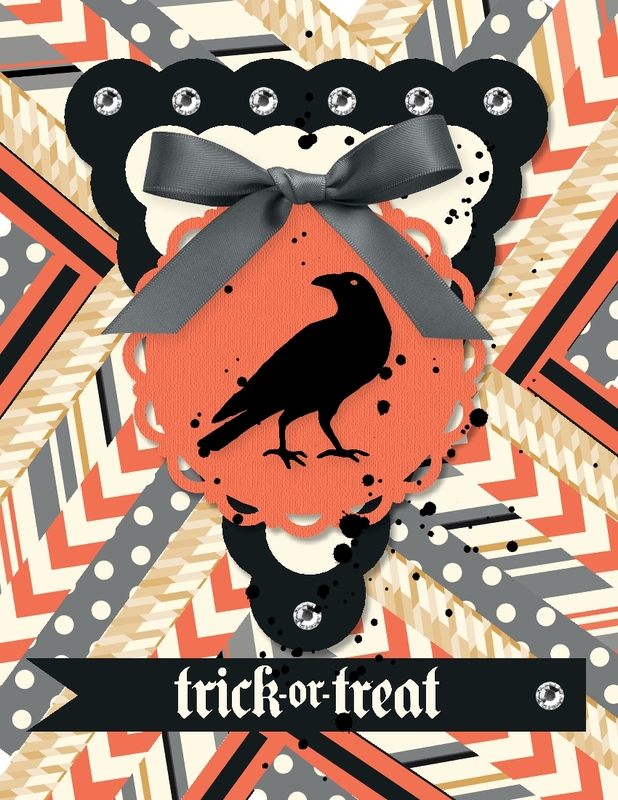 The jeweled swag, bird and spider were stamped with Momento Black and die cut from whisper white. The jewels were colored with an Aqua painter then colored with Clear Wink of Stella . To make it all sparkle I added basic rhinestones and topped with a Lemon Twist bow. All Stampin’ Up! supplies below may be ordered fr om my website or email me to place your order. I love Halloween! Growing up my family every year we a had Halloween party to celebrate my father’s birthday. My father passed away last year but I still make a card for him in his memory. 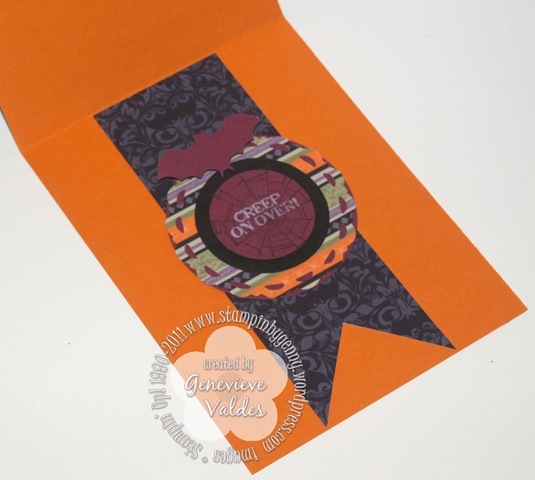 My card this week is based on the sketch at Hand Stamped Sentiments and the Great Pumpkin from Charlie Brown. I created my own background paper by stamping the eyes with Versamark then heat embossing with white and iridescent embossing powders. The iridescent embossing powder is retired but I still have some and I use it when I want to add a little sparkle. The cute jack-0-lantern is stamped with Tangerine Tango on Pumpkin Pie from the Jar of Haunts stamp set which can be ordered from the 2016 Holiday catalog. The leaf and stalk I stamped with Early Espresso, fussy cut and outlined the leaf and veins with Early Espresso and colored with Soft Suede and Pumpkin Pie. The jar is stamped on White Shimmer with black ink then die cut using the jar framelit from the Everyday Jars Framelits set. I adhered the Silver Satin Ribbon then adhered the jar. The banners Silver and Black Glimmer paper die cut using the Banner Triple punch. For an extra punch of bling I used basic rhinestones on the eyes and all over the black layer. Be inspired and join the challenge at Hand Stamped Sentiments. For more inspiration see what the designers have created. My card this week is inspired by the latest Hand Stamped Sentiments sketch challenge. I created my card with Among the Branches Stamp Set and Woodland Textured Impressions Embossing Folder bundle. My card was also inspired by the card on page 39 of the Holiday mini catalog. I embossed Basic Gray card stock with the Woodland Textured Impressions Embossing Folder and stamped the bird and eye images. I also used a Spider Web doily. I stamped the greeting with Pumpkin Pie and adhered to the center of the doily web with dimensionals. For added sparkle I spread Dazzking Details allover the background. I also added basic rhinestones to the edges of the doily. We’d love to see how this sketch inspires you. 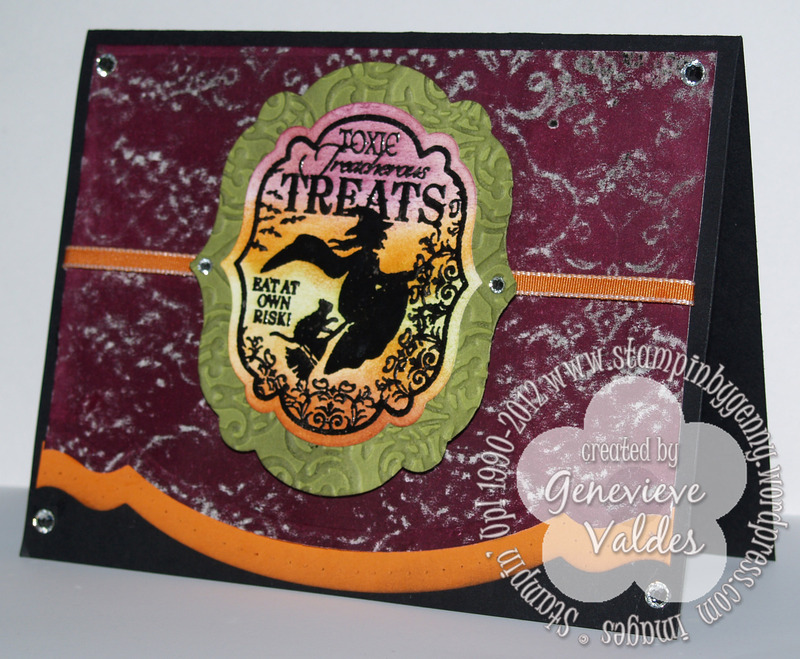 Go to Hand Stamped Sentiments to see more inspiration! 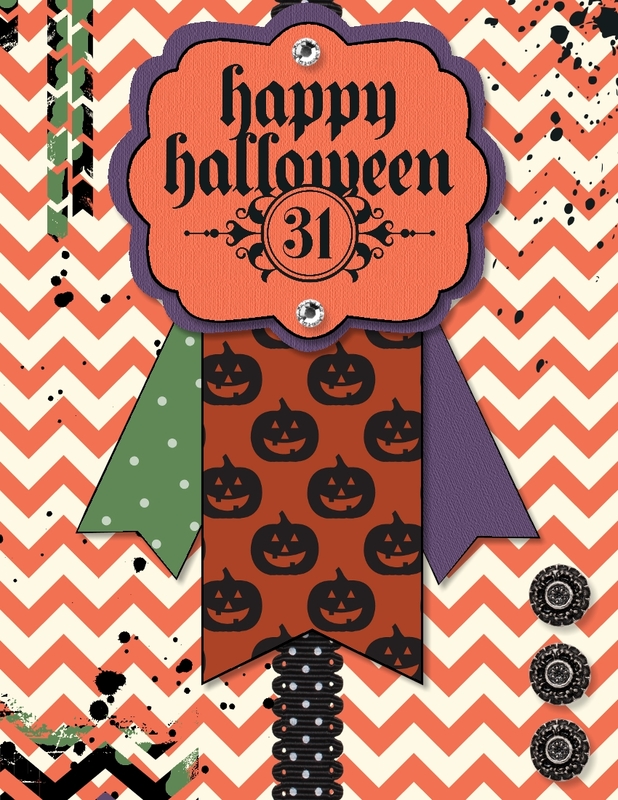 For this week’s challenge I decided to play with My Digital Studio to create a Halloween card. The colors were inspired by Hand Stamped Sentiments color challenge of Tangerine Tango, Elegant Eggplant, Garden Green and Basic Black. Don’t these colors just scream HALLOWEEN! It was so much fun using the coloring tool to add different colors to the digital stamp images. If you haven’t tried digital crafting, download the free trial version of MDS here. You can create cards, scrap book pages and books, journals and whatever your paper crafting mind can conjure. 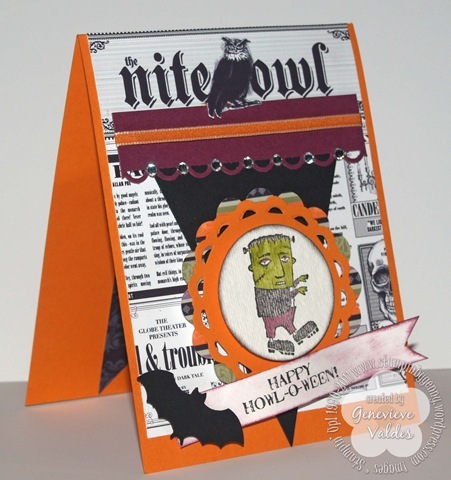 Create a scary or funny Halloween card, scrap book page or 3D item using these colors and upload your card to Hand Stamped Sentiments. 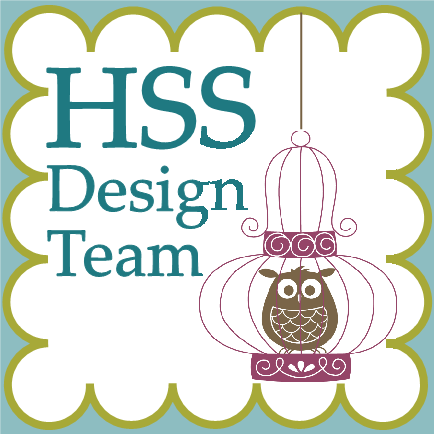 If you need more inspiration go to HSS and see what our very talented design team has created. 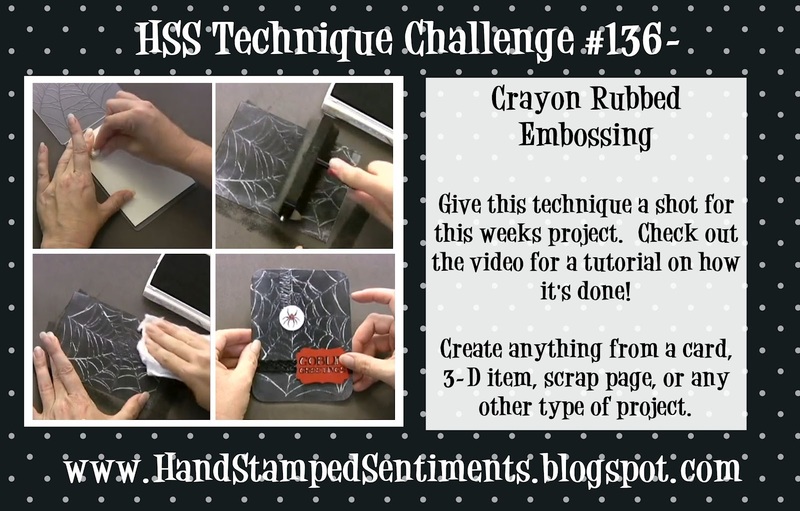 This week on HSS we have a technique challenge – Crayon Rubbed Embossing! I had never done this technique before and decided to use a black crayon instead of white to create an eerie spooky background…kind of grungy and kind of vintage. I love this technique! I used sponge daubers to sponge Raspberry Ripple, Pumpkin Pie and Lucky Limeade to create an eerie background for my black embossed witch. See all the wonderful projects by our talented design team. I hope you’re inspired by this very fun technique. I recently purchased the MDS2 upgrade and I LOVE IT! It’s so much easier to work with and so many new features. 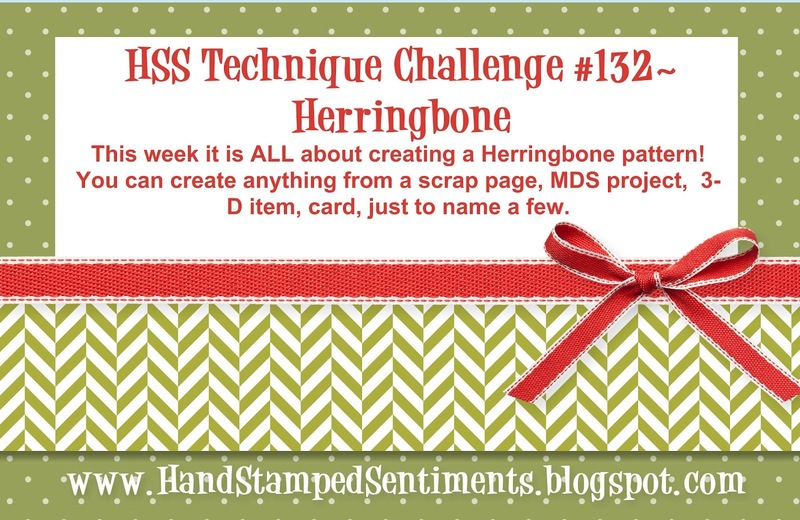 I was so excited about it that I created this week’s Hand Stamped Sentiments challenge project using MDS2 to create the Herringbone technique. I used the Houndstooth & Scaringbone digital DSP to create the background. It was so easy to create digitally. For a tutorial on how to create this technique go to SCS. So easy!! Visit Hand Stamped Sentiments to see all the wonderful projects from our very talented design team. I hope you’re inspired to give this technique a try. It’s so much fun! 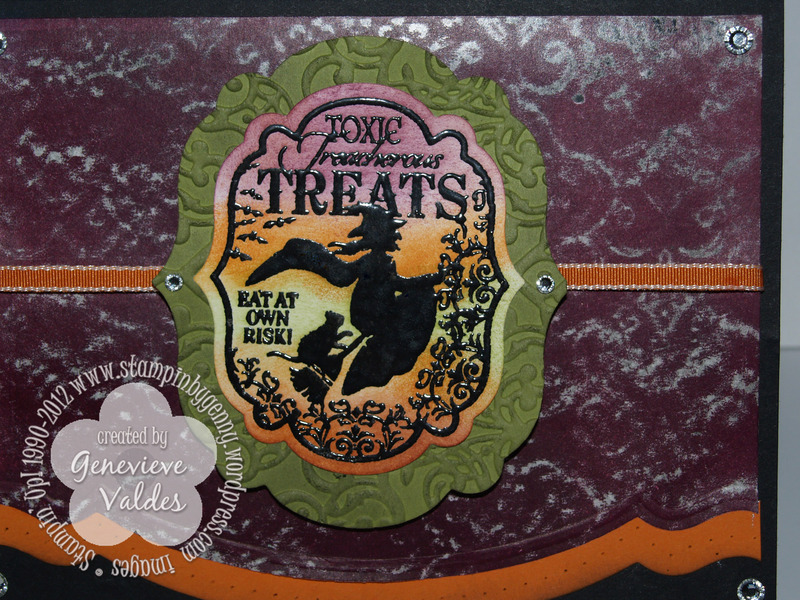 This week Hand Stamped Sentiments is having a Banner Bash! Create any paper craft project using banners or pennants. I’ve been wanting to use my new Halloween stamp set Howl-o-Ween Creeps so here’s a sneak peek of one of the monster images and sentiments. This set is so much fun! I can’t wait to create more Halloween items with this set. I stamped the Frankenstein image on water color paper then used a blender pen and ink pads to color him. I punched him out with 1-3/4 inch circle punch and sponged the edges with Basic Black ink. Since the theme for the challenge is pennants I decided to create one large pennant using the Perfect Pennants die for the front of my card. I then printed with My Digital Studio the DSP layers. 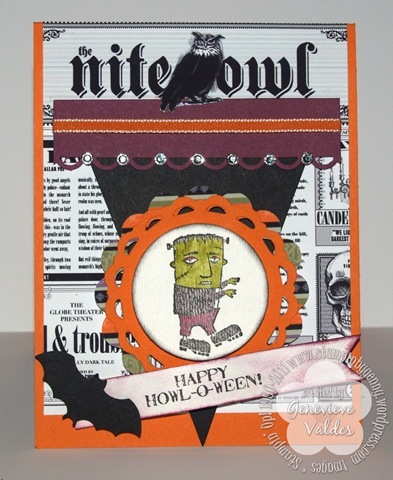 I used Cast a Spell and the Night Owl Digital kit. I hope you’re inspired to start thinking about your fall and Halloween projects. The Howl-o-Ween Creeps stamp set will be available on September 1st. Join us Hand Stamped Sentiments for our Banner Bash Theme Challenge!